Flood in Manipur has become an annual phenomenon particularly in the hilly terrains and in some villages under Senapati district bordering Nagaland. A heavy downpour on August 12 and 13 caused landslide and flash flood in the hilly Phaibung Khullen village, 130 km north of Imphal destroying many paddy fields covering more than 300 acres. 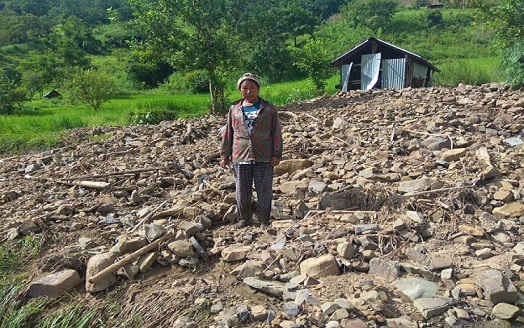 “Initially the rain had caused landslide that blocked the river near Chingai Khullen and Khunou areas and subsequently flooding a large area of paddy fields of the village which houses more than 700 households,” Kh Benjamin, Secretary of Phaibung Khullen village said. Now paddy fields belonging to around 100 households of the village have been completely washed away by the flash flood. Four important hanging bridges to reach the village paddy fields and all the irrigation canals numbering around 50 were also badly damaged. Apart from ravaging large area of paddy field, standing crops were damaged by mud and pebbles as the flood water from other side entered the paddy field. “We could have managed if the incident happened in June or July, he added. But the situation is alarming as the incident happened in this time (August).Those villagers who lost their standing crops couldn’t go for re-plantation,” Benjamin said. So the flood affected villagers are seeking necessary assistance from the authorities concerned in the state. On August 26 last year, as many as 22 houses were destroyed in Senapati district following heavy rains accompanied by landslides. Four days later, rainfall with similar intensity washed away almost all the paddy fields of two villages-Sorbung and Ngatan under Tadubi block forcing the villagers to face untold miseries.